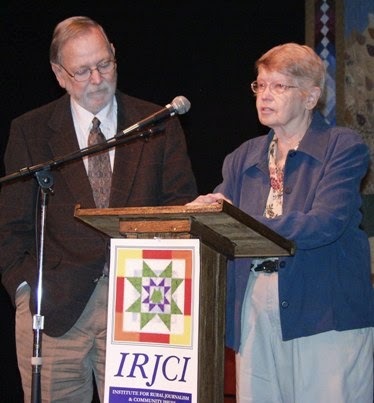 Nominations for the Tom and Pat Gish Award for courage, tenacity and integrity in rural journalism, given by the Institute for Rural Journalism and Community Issues, must be mailed by Aug. 1. The award is named for Tom and Pat Gish, who published The Mountain Eagle in Whitesburg, Ky., for more than 51 years. They withstood advertiser boycotts, business competition, declining population, personal attacks, and even the burning of their office to give their readers the kind of journalism often lacking in rural areas, and were the first winners of the award named for them. Other winners have been the Ezzell family of The Canadian (Tex.) Record, in 2007; James E. Prince III and Stanley Dearman, current and former publishers of The Neshoba Democrat of Philadelphia, Miss., in 2008; Samantha Swindler, editor and publisher of the Headlight Herald in Tillamook, Ore., in 2010 for her work as editor of the Corbin, Ky., Times-Tribune and managing editor of the Jacksonville (Tex.) Daily Progress; in 2011, Stanley Nelson and the Concordia Sentinel of Ferriday, La. ; and in 2012, Jonathan and Susan Austin of the Yancey County News in Burnsville, N.C. No award was given in 2013. The Institute seeks nominations that measure up, at least in major respects, to the records of previous winners, which are detailed at www.RuralJournalism.org. Nominators should send detailed letters to Institute Director Al Cross, explaining how their nominees show the kind of exemplary courage, tenacity and integrity that the Gishes demonstrated in their rigorous pursuit of rural journalism. Detailed documentation does not have to accompany the nomination, but is helpful in choosing finalists, and additional documentation may be requested or required. Questions may be directed to Cross at 859-257-3744 or al.cross@uky.edu. The award will be presented at a dinner in Lexington, Ky., on Nov. 13.
Letters should be postmarked by Aug. 1 and mailed to: Institute for Rural Journalism and Community Issues, 122 Grehan Journalism Building, University of Kentucky, Lexington KY 40506-0042. Circulation of 6,000 or more: First place, The Washington Missourian; second, The Standard-Banner, Jefferson City, Tenn.; third, the Cape Gazette, Lewes, Del; honorable mention, The Livingston Parish News, Denham Springs, La. Circulation 3,000 to 5,999: The Alamance News, Graham, N.C; second, the Mount Desert Islander, Bar Harbor, Me. 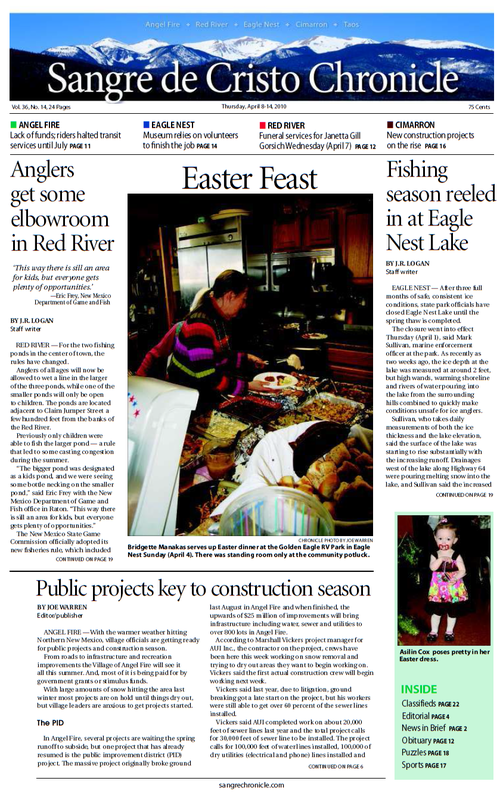 ; third, The North Scott Press, Eldridge, Iowa; honorable mention, the Wise County Messenger, Decatur, Tex. Under 3,000: Sangre de Cristo Chronicle, Angel Fire, N.M.; second, the Ozona Stockman of Texas; third, Nebraska's West Point News; honorable mention, North Dakota's Tioga Tribune. Dailies: James Beaty, Kandra Wells, Kevin Harvison, Brandy Jeffreys of the McAlester News-Capital, for a package of stories on the 40th anniversary of an Oklahoma prison riot; second and third place, Nick Hytrek of the Sioux City Journal, for stories on a cold case and early release of Iowa prison inmates. Non-dailies, circulation 10,000 or more: First place, Tom Dunlop, Sara Brown and photographer Ray Ewing, The Vineyard Gazette, Edgartown, Mass., for a series on coastal erosion; second, Jennifer Johnson, The Beaumont Examiner, on waste in a Texas school district. Non-dailies, circulation 3,000-9,999: First place, Mike Koshmrl of the Jackson Hole News & Guide, for a story on the local airport board making regular "official" trips to Hawaii (here's a follow-up); second, Jared Strong of the Times Herald in Carroll, Iowa, on a killer who fell through cracks in the system; third, Publisher Tom Boney Jr., Tomas Murawski, Janice Crisp and Kristy Bailey of The Alamance News, Graham, N.C., for an examination of a state agency's cases against the local sheriff. Non-dailies, under 3,000: First place, Phil Johnson of The Western News, Libby, Mont., for stories (here's one) on overtaxation; second, Melissa Meinzer of Missouri Lawyers Weekly, St. Louis, for stories on lawyer discipline hearings; third, Amy R. Sisk and Resa Haukedahl of the Tioga Tribune, for stories showing the need for more law enforcement in the North Dakota oil-boom town; honorable mention, Bill Moss of the Hendersonville Lightning in North Carolina, for "Legal fights imperil restitution promises." 10,000 or more: The Taos News, for an editorial by Joan Livingston criticizing the city council and mayor for circumventing of New Mexico's open-meetings law. 6,000-9,999: The Cody Enterprise of Wyoming, for an editorial by Bruce McCormack criticizing a state representative's rudeness. 3,000-5,999: The Hutchinson Leader of Minnesota for "County has gone gun crazy," an editorial by Doug Hanneman. Under 3,000: The Sangre de Cristo Chronicle of Angel Fire, N.M., for "Red River is not above the law, an editorial by Jesse Chaney. 6,000 or more: First place, the Wyoming Tribune Eagle of Cheyenne; second, the Leelanau Enterprise of Michigan; third, The Washington Missourian; honorable mention, the Antelope Valley Press of California and the Ellsworth American of Maine. Under 6,000: First place, the Mount Desert Islander of Bar Harbor, Maine (same ownership as the Ellsworth American); second, the West Point News of Nebraska; third, The Clarendon Enterprise of Texas; honorable mention, the Iowa Falls Times-Citizen. 9,000 or more: Matthew Renda and photographer John Hart of The Union, Grass Valley, Calif., for a series on the Yuba River. Under 9,000: David Bunker of Moonshine Ink, Truckee, Calif., for a story on quagga mussels in Lake Tahoe. 6,000 or more: First place, Megan Moser of The Manhattan Mercury of Kansas; second, Ginny Privitar of The Chronicle, Chester, N.Y., third, Starla Pointer of teh News-Register, McMinnvile, Ore. Under 6,000: First place, Luige del Puerto and Jeremy Duda, the Arizona Capitol Times, Phoenix; second, Maek Good of the Mount Desert Islander; third, Ellary Prenice of The Paynesville Press in Minnesota. Dailies: Aerin Curtis of the Wyoming Tribune Eagle, for a story on new teacher-evaluation standards. Large non-dailies: Steve Marion and Ronnie Housley of The Standard-Banner of Jefferson City, Tenn., for a story about reading that was easy reading: "It isn't long, but full of good writing," the judges wrote. Freedom of information (daily and non-daily): Wyoming Tribune-Eagle, for editorials on openness at the University of Wyoming; second, Arizona Capital Times, Phoenix, for reports on lobbying. Best website (daily and non-daily: Hendersonville (N.C.) Lightning; second, Santa Clarita Valley Signal of California; third (tie), the News-Register, McMinnville, Ore., and Lakota Country Times, Martin, S.D. Other categories include feature story, localized story, performing arts story, review, obituary, cartoon, column, typography, special section, photo essay, and use of photographs. A list of all winners by category is here. The contest also includes an advertising division. For more information about the contest and the convention, see www.nnaweb.org. "The agreement also defined the company's operations as not only including drilling activity but the construction of pipelines, power lines, roads, tanks, ponds, pits, compressor stations, houses and buildings," Sadasivam writes. Doug Clark, a gas-lease attorney in Pennsylvania who mainly represents landowners, told Sadasivam, "The release is so incredibly broad and such a laundry list. You're releasing for everything including activity that hasn't even occurred yet. It's crazy." While these type of agreements are common in areas around airports, wind farms and landfills, it's rare for one to include oil and gas wells, Sadasivam writes. Clark told her, "This is only the second time I've seen one. They're absolutely not common at all." More than one-third of U.S. crude oil is produced in Texas and nearly half of the nation's oil production is limited to two states -- Texas and North Dakota, according to data from April 2013 to April 2014 released by the U.S. Energy Information Administration. Over the last two years, 9,166 post offices have had their retail hours shortened, and 1,257 are now only open two hours a day, Federal Times reports in a story saying more than 3,000 postmasters will be offered buyouts and early retirement. "But the Postal Service is also working on expanding its 'village post office' program, where the agency teams up with a local retailer to offer some postal services," Andy Medici reports. "By being located inside established businesses and other places consumers already frequent, VPOs offer Postal Service customers time-saving convenience, and in most cases, longer hours than regular Post Offices, U.S. Postal Service spokeswoman Darlene Casey told Medici. In the buyout offer, "Postmasters will get up to $10,000 if they choose to resign or if they take an early or optional retirement option, according to documents emailed to employees by the Postal Service over the last few days," Medici reports. "Those who take the incentives will leave the Postal Service Sept. 30." Postmasters who don't take the incentives can apply for other jobs within the service, but could lose their jobs when it implements a "reduction in force" plan on Jan. 9, 2015. A federal judge has blocked the proposed expansion of an underground coal mine on federal land in Colorado "because federal agencies failed to consider the future global-warming damages from burning fossil fuels," John Cushman reports for InsideClimate News. U.S. District Court Judge R. Brooke Jackson said that when agencies touted the economic benefits of Arch Coal's proposal they should have considered climate-change effects, including the bulldozing of six miles of roads on 1,700 acres of public land in the Sunset Roadless Area in Summit County. "The decision was a significant judicial endorsement of a policy tool known as the 'social cost of carbon,' which economists and climate scientist use to put a price in today's dollars on the damages from drought, flood, storm, fire, disease and so forth caused by future global warming due to our emissions from burning fossil fuels," Cushman writes. Tennessee has made it tougher to purchase over-the-counter drugs used to make methamphetamine. This week a new law went into effect putting a cap on purchases of pseudoephedrine without a doctor's prescription to 5.8 grams per month and 28.8 grams per year, which "is about five months' worth of the maximum dose of Sudafed," the most common brand of the product, Briona Arradondo reports for WTVC in Chattanooga. Last year state authorities busted 1,700 meth labs and removed 260 children from meth-related situations. Postmaster General Patrick Donahoe announced Monday that as many as 82 mail-processing plants will close next year, a move that would cut annual operating costs by about $750 million, reports Post & Parcel. In 2012 and 2013 the U.S. Postal Service closed 141 facilities, saving about $850 million a year. New closures would drop the number of facilities to 238, from 673 in 2006. A list of the 82 facilities to be closed is here. A USPS memo about the move is here. In response to the announcement, National Newspaper Association President Robert M. Williams Jr., publisher of Georgia's Blackshear Times, wrote a letter to Donahoe expressing the importance of mail service in rural and small towns. News-media and other commercial drone operators waiting for the Federal Aviation Administration to release regulations on the unmanned aerial vehicles will have to keep waiting. An internal government audit found that the FAA, which has already missed several deadlines, will miss the September 2015 deadline set by Congress "because of technical and regulatory obstacles that are unlikely to be resolved anytime soon," Craig Whitlock reports for The Washington Post. "The FAA is significantly behind schedule in drawing up rules and standards to ensure that drones are airworthy, that pilots are trained properly and that their aircraft won’t interfere with other air traffic, the Transportation Department’s inspector general concluded in a highly critical audit," Whitlock writes. "The report said the FAA has so many hurdles to confront that it is unclear when — or if — remotely controlled aircraft can be safely integrated into U.S. airspace." Meanwhile, drones have been used by farmers and journalism programs, rural journalists, the energy industry and law enforcement, and drone use was recently banned in national parks. The Common Core State Standards, designed to regulate what students learn each year in school, were originally adopted by 45 states and the District of Columbia, but now that states are dropping out (the latest being Louisiana), the question remains: Can states lose federal funding for choosing not to implement the standards or continue with them? Louisiana Gov. Bobby Jindal said that Education Secretary Arne Duncan pushed states into following the standards, Alyson Klein writes for Education Week. "The proponents of Common Core claim it is not a federal takeover, but Secretary Duncan's comments and actions prove otherwise. He has already threatened Oklahoma with a loss of funding, and we may be next," Jindal said. However, the executive director of communications for the Oklahoma State Department of Education said the state was not threatened with funding cuts, and Duncan said at a White House brieifing, "We partner with states whether they're in Common Core or have their own standards. But where we will challenge status quo is when states dummy-down standards." But were states coerced into adopting the standards? The Obama administration did offer states with uniform, rigorous standards an edge in the "Race to the Top" grant competition, and states that wished to be waived from the No Child Left Behind Act mandates were asked to "embrace standards that would get students ready for post-secondary education," Klein writes. An NBC News First Read item asks what makes Paul's idea so different from the Common Core itself: "How much does this marketing pitch (self-teaching, interlocking disciplines, big-picture thinking) sound like the things conservatives love to hate about Common Core itself—which is dictating a curriculum in the first place?" Mountaintop removal is having a negative impact on fish populations in Appalachian streams, according to a U.S. Geological Survey study published in the journal Freshwater Science. The study found that these areas have "fewer than half as many fish species and a third as many total fish as other regional waterway," Ken Ward reports for The Charleston Gazette. The measure, supported by the group Safe Clean Colorado and backed by Democratic Rep. Jared Polis, still needs the required 86,000 signatures to appear on the November ballot, Gilmer writes. But if it makes it on the ballot, and is approved by voters, it "would amend the state constitution to ensure that municipalities can ban or limit hydraulic fracturing and other industry activity within their borders. The measures also stipulate that mineral owners may not sue for a regulatory taking if a local government blocks development of their oil and gas." Counties were ranked based on percentage of residents with bachelor's degree, "median household income, unemployment rate, disability rate, life expectancy and obesity," Allan Flippen writes for The Upshot, a Times blog that did the analysis. "We tried to include other factors, including income mobility and measures of environmental quality, but we were not able to find data sets covering all counties in the United States." New York is not in a fracking state of mind. The state's high court ruled 5-2 Monday "that towns can use zoning ordinances to ban hydraulic fracturing," better known as fracking, Kate Taylor and Thomas Kaplan report for The New York Times. While oil fields in La Salle County produce more than $15 million worth of oil a day, local residents are struggling to survive, Fernandez and Krauss write. La Salle County, where President Lyndon B. Johnson worked and was reportedly inspired to help the poor, eventually with his War on Poverty, is home to one of several "makeshift, barely governed communities called colonias. An estimated 500,000 people live in about 2,300 colonias in Texas, along its 1,200-mile border with Mexico. Many colonias have benefited from infrastructure improvements in recent years. Others remain institutionalized shantytowns without basic services like water and sewers," or even police. "Decades after Johnson took a teaching job here in 1928, the area, like the country, is a startling and incongruous mix of cascading wealth and crushing hardship," Fernandez and Krauss write. "And though the boom has helped produce fortunes for some and comfortable lives for many, for others it exists within a rural landscape of unpaved streets without garbage pickup, where few dare to drink the tap water because it tastes and smells like chlorine. It is a different kind of poverty than it was in 1928, this time surrounded by a buzz of industrial activity, not empty stretches of scrub grass. But it feels as entrenched as ever, reinforced by bad luck, bad choices, a lack of education and the isolation that allows the poor to remain invisible and adrift in lonely, distant orbits." Studies have shown that 42 percent of residents in the colonias live below the federal poverty line, compared to the national rate of 14.3 percent, Fernandez and Krauss write. In La Salle, the median annual household income is $29,000 and 39 percent of children live in poverty. Making things worse, the boom has led rent to skyrocket and "newly hired teachers had such a hard time finding housing they could afford that the Cotulla school district opened its own trailer park for them." The U.S. Postal Service's financial woes have been well-documented, with the agency reporting a $5 billion loss in 2013, as it continues its push to end Saturday mail delivery, with the exception of packages. But as USPS continues to come up with ways to save money, often at the expense of rural residents, perhaps one of the biggest hits USPS takes is in its participation in a federal program exclusive to Alaska, called the Alaska Bypass, that delivers shipments, even groceries, to Alaskans living in areas so remote they have little to no access to stores with basic necessities. "The Postal Service is responsible for shipping more than 100 million pounds a year of apples, frozen meat, dog food, diapers and countless other consumer items to off-road villages in the sparsely populated outposts known as the bush," places not connected to the rest of the nation by road, Lisa Rein reports for The Washington Post. "Over three decades acting as freight forwarder, the agency has lost $2.5 billion." Last year the program cost USPS $77.5 million, "with ordinary stamp-buying customers covering the tab, while a long line of commercial interests here benefited, from the airline and shipping industries to rural grocery chains." "Retailers pay the Postal Service about half of what it would cost them to ship the goods commercially; the subsidy allows them to charge a hefty markup on a can of Coke, for example, in some cases 30 percent or more," Rein writes. "The agency, by law, must pay private air carriers well above market rates in the only corner of the country where airline prices are still regulated." Costs are high for consumers, but low for businesses. Residents often pay $15.15 for a 12-pack of Coke, but the pallet it came on cost USPS about $3,200, while "Alaska Commercial paid only about $485 in postage," Rein writes. "Not only is this well below commercial rates, it’s even less expensive — about 20 percent less per pound, postal regulators say — than customers anywhere else in the country pay to send a package via parcel post." That's where the program differs from others, Rein writes. "As part of its obligation to provide universal delivery, the Postal Service ferries, flies, hovercrafts and even dispatches mules to a handful of other remote communities where letter carriers can’t drive. But only in Alaska do packages weighing at least 1,000 pounds — 930 pounds above the heaviest parcel post box allowed in the Lower 48 states — count as a universal service. Only in Alaska do flat-screen televisions, paper towels, charcoal grills, citronella candles and apples count as mail." Rural residents in Republican-led states that chose not to expand Medicaid under federal health reform are more likely to remain uninsured than their rural counterparts , Savannah Wooten confirms for the Daily Yonder. Of the 7.3 million uninsured rural residents, 52 percent live in states that didn't expand Medicaid, according to a study by the Kaiser Family Foundation. Between 2012 and 2013, only 51 percent of rural workers were enrolled in employee-covered insurance, compared to 57 percent of urban workers, the study found. "However, before ACA implementation, the rural population was significantly more likely to be covered by Medicaid (21 percent) or other public insurance (4 percent) than the metropolitan population (16 and 3 percent, respectively). Because Medicaid made up some of the gap in employer-sponsored coverage in rural areas, the uninsured rate was similar across rural and metropolitan populations prior to the ACA." Last week The New York Times published a story saying that six Eastern Kentucky towns were among the 10 most difficult places in the U.S. to live based on longevity of life in relation to education, income, unemployment rate, disability rate, obesity rate and life expectancy. Tim Marema, editor of the Daily Yonder, responds to the Times story by comparing it to a similar story that appeared a few days later in the newspaper that he says contradicted the first story by coming to the conclusion that people in struggling rural areas are liabilities who need to move away, while those in struggling urban ones are assets who need to stay put. "In a magazine piece titled 'The Problem with Eastern Kentucky,' Annie Lowrey says mountain residents should hit the road to find better economic opportunity," Marema writes. "She argues that safety-net and anti-poverty programs are actually hurting the economy in the long run because they don’t encourage mobility. But Monica Davey reports from Detroit in a Times’ news story that the Motor City 'desperately needs to hold onto residents.' The reason: to keep the city viable by retaining a critical mass of population." "The pieces are like night and day," Marema writes. "In the story on rural Kentucky, Lowery argues that government poverty-reduction programs hurt people by encouraging them to remain in a distressed area. From Detroit, Davey reports on the efforts of public entities to lessen the burden of home foreclosures and tax liens. There’s not a whiff of disagreement from any quarter—what Detroit needs most is for people to stay where they are." "So why do two stories, both covering the topic of economic distress, both dealing with migration, printed within days of each other in the Times, focus on such different solutions to the problem?" Marema writes. "Could it have something to do with the fact that Detroit is urban and Eastern Kentucky is rural? In Detroit, people are assets, the building blocks of a new future. In rural Kentucky, they’re liabilities, the remnants of a failed economic past. In Detroit, folks need to shelter in place for the betterment of all. In Kentucky, it’s long past time to load up and move on . . . If people are assets, paying for their relief is good. If people are liabilities, helping them is money down the drain." Although Lowery does not approve of the "'trillions of dollars spent to improve the state of the poor in the United States and promote development,'" spending that money to help those who live in cities is apparently advantageous, Marema writes. "More than a few public dollars have flowed into Detroit in the last generation to relieve poverty and rebuild infrastructure. But there’s still plenty of poor people there." Lower's Eastern Kentucky facts are accurate, and it can be a difficult place to live. Millions of rural Appalachians have, in fact moved away—and many went to Detroit, he writes. "And we’re willing to bet the people now leaving that city include plenty of Appalachian descendants." Natural gas might not be as good for the climate as previously thought, according to a study by researchers at the National Oceanic and Atmospheric Administration's Earth Systems Research Laboratory published in the journals Environmental Science and Technology and ACS Sustainable Chemistry and Engineering. Researchers found that natural gas fields throughout the world may be leaking enough methane "to make the fuel as polluting as coal for the climate over the next few decades," Gayathri Vaidyanathan reports for ClimateWire. And some oil and gas fields in the U.S. "are emitting more methane than the industry does, on average, in the rest of the world, the research suggests." "From wellheads, pipes, valves, compressors and various other equipment, gas wells leak raw methane, a greenhouse gas that is 86 times as potent as carbon dioxide over a 20-year time scale, according to the Intergovernmental Panel on Climate Change," Vaidyanathan writes. "While CO2 persists in the atmosphere for centuries, wreaking climate havoc slowly, methane works more rapidly for a short while before decaying into less virulent gases. For the climate equation, both CO2 and methane emissions matter, scientists say. Everything you need to know about starting a career in farming or ranching is now available on the U.S. Department of Agriculture website. As part of the Farm Bill, USDA announced last week "a new website that will provide a centralized, one-stop resource where beginning farmers and ranchers can explore the variety of USDA initiatives designed to help them succeed," says a news release from the organization. Because the average age of principal farm operators is 58.3—up from 57.1 in 2007, according to the Census of Agriculture—USDA is focusing attention on getting younger Americans interested in farming, Deputy Secretary Krysta Harden said in the release. She said, "Our new online tool will provide one-stop shopping for beginning farmers to learn more about accessing USDA services that can help their operations thrive." DURANGO, Colo. – One of the few weekly newspaper editors or publishers to win a Pulitzer Prize was honored again Saturday night with the top award of the International Society of Weekly Newspaper Editors. ISWNE also presented other awards, including its "Golden Dozen" for editorial writing, long the organization's primary focus. Dave Mitchell was the toast of American journalism 35 years ago, when his Point Reyes Light won the Pulitzer for public service for its investigation of the Synanon cult in Northern California, He sold the paper in 2005 and told the awards-dinner crowd that he thought he was fading away like the old soldiers cited by Gen. Douglas MacArthur in his farewell speech to Congress. But then he learned that he had won ISWNE's Eugene Cervi Award, given for an outstanding career of public service through community journalism while adhering to the highest standards of the craft as demonstrated by Cervi, who published the Rocky Mountain Journal in Denver until his death in 1970. "To me this is like winning a second Pulitzer," Mitchell said. "It had been so many years that I had put on a tie, I couldn't remember how to tie it." Mitchell said he had been a member of many newspaper and journalism organizations, but "This is the only one I've stayed with. . . . It's like discovering a family I never really had. You are my family." ISWNE conferences can seem a little like family reunions because the group is small (265 members) and some children attend, but it is deadly serious about promoting strong editorial voices in weekly newspapers, many of which lack them. The heart of each annual conference are roundtables at which editors critique each other's editorial pages. The winner of the Golden Quill Award for best editorial published in 2013 was Brian Hunhoff of the Yankton County Observer in South Dakota, who drew on his experience as an elected county commissioner to write an editorial saying that "All too often, elected officials look for loopholes or excuses to take a discussion behind closed doors. . . . Executive sessions are generally over-used." Hunhoff, a Republican who is now the county's elected register of deeds, wrote that some elected boards in South Dakota "have three or four executive sessions in a single meeting, and "Some boards have developed a dismal habit of hiding in executive session if an issue becomes controversial." Hunhoff, who also won a Golden Quill in 1995, was the owner of the Observer during the first half of his decade as a county commissioner (from 1998 through 2006), then sold the paper. He resumed writing editorials for it every other week under new owners two years ago. He wrote in the latest edition of ISWNE's quarterly Grassroots Editor that his political experience taught him "how easily a conversation in executive session could stray to other topics . . . and how far commissioners will bend and stretch allowable reasons for executive sessions to fit the issue they wish to take behind closed doors. Over 10 years as a county commissioner, I refused to participate in several executive sessions when I thought we had moved off topic." Hunhoff also wrote that when he was a commissioner, his feature-oriented weekly did not usually cover commission meetings. "I realize many journalists frown on one person wearing both hats. I understand and respect objections to crossing those lines. I would simply respond that every situation is different and it worked for me (most of the time)." The Golden Quill is the top editorial among the Golden Dozen. Other winners were Andy Schotz of The Gazette in Silver Spring, Md. ; Missy Layfield of The Island Sand Paper in Fort Myers Beach, Fla.; outgoing ISWNE President Kelly Clemmer of The Wainwright Star in Alberta; Mike Buffington of The Jackson Herald in Georgia; Marcia Martinek of the Herald Democrat in Leadville, Colo.; Faith Wylie of the Oologah Lake Leader in Oologah, Okla.; Steve Bonspiel of The Eastern Door in Kahnawake, Quebec; William Schanen III of the Ozaukee Press in Port Washington, Wis. (a two-time Golden Quill winner); Cary Hines of the West Valley View in Avondale, Ariz.; 2012 Golden Quill winner Vernon Oickle of the Lunenberg County Progress Bulletin in Bridgewater, N.S. ; and Katelyn Stanek of The Woodstock Independent near Chicago. ISWNE also has members in England, Scotland, Ireland and Australia. Its next conferences will be in Columbia, Mo., in 2015 and in Melbourne, Canberra and Sydney, Australia in 2016. For more information see www.iswne.org.